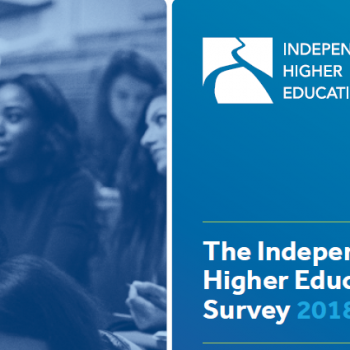 The Independent Higher Education Survey 2018 released today (27 November) makes clear that independent higher education providers are committed to the new regulatory system but do not yet feel the government has created the level playing field they sought to achieve with the Higher Education and Research Act. Over 50% had already registered with the Office for Students, although the registration framework still remains a challenge for those providers least like a traditional publicly funded university. The Universities Minister Sam Gyimah and the rest of the Government have pledged to support new providers to enter the higher education sector, recognising the benefits that expanding choice and competition bring to students, and the innovation which can result from new ideas and new approaches. New providers will start small, as will the kind of genuine innovation which results from experimenting with different models of teaching and learning. That makes it essential that the new regulatory system does not discriminate against small providers or disadvantage the students who choose to study in them. The results of the IHE Survey set out starkly the financial penalty that the proposed fee bands for the Office for Students will impose on students who opt for one of these new and innovative small providers. Whereas a student at a large traditional university will pay just £5 per year towards the direct cost of regulation, one who goes to an independent college with between 100 and 300 students (the most common size band in the independent sector) will pay £120 per year, while someone who chooses the most specialist provision at a provider with less than 25 higher education students could see £700 of their tuition fee go straight into the budget of the regulator and its designated bodies. The annual Independent Higher Education Survey 2018 shares the key characteristics of independent providers of higher education including size, courses, students, missions and corporate forms. Alongside their thoughts and ideas on the pressing issues for higher education today, the survey also looks at their plans and concerns for the future. View the survey at: weblink. Independent Higher Education is the UK membership organisation and national representative body for independent providers of higher education, professional training and pathways. Further information can be found at our website – http://www.independenthe.com/. We can also be found on Twitter @independent_HE.